Please note that once you have selected a size, all elements of the package will come in that size. No substitutes. 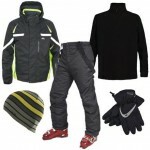 Dare2b Sweeper Men's Skiwear Package - Mid Layer Option.